This 34mm. 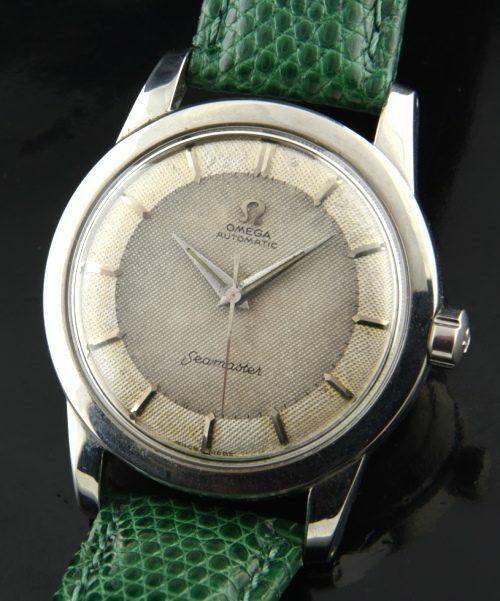 OMEGA SEAMASTER dates to 1950. The automatic early bumper automatic movement was just cleaned and is accurate. The rest of the watch was untouched; with and original waffle dial, steel Dauphine hands, beefy lug screw-back OMEGA case and original winding crown. I love the look of the aged two-tone dial-you have to see it in person to appreciate the alluring vintage look! The case also looks fantastic in person. Any marks in my photos of the case are just reflections or fingerprints. These are becoming harder to find these days, in all original condition.